A 5-year-old Guatemalan girl, who spent almost three months in U.S. government custody at a shelter in New York after being separated from her father at the California border, was finally returned to her parents Tuesday in Guatemala City. Filomena's parents, Nazario and Marcela, hugged their little girl and cried at a child welfare home run by a Guatemalan government agency. Their daughter arrived in the capital on a commercial flight, along with several other children sent home by U.S. immigration authorities. (KQED is not disclosing their last names because the parents are concerned for the family's safety). "It was very difficult to be separated like that," said Nazario, 32. "I feel happy again to have her with us." Nazario has been trying to regain custody of Filomena ever since May 16, when, he said, two Border Patrol agents took her from his arms in a San Diego County holding facility. The father and daughter were one of almost 3,000 families separated as a result of the Trump administration's "zero tolerance" policy, announced in April, to prosecute all unauthorized immigrants arrested at the border. U.S. authorities later prosecuted Nazario in criminal court for illegally entering the country. He said he had fled to the United States after gang members threatened his life. But he gave up his claim for asylum, believing that doing so would allow him to get his child back. He was deported on June 20 without Filomena. Filomena was one of more than 400 children who remained in U.S. government custody after their parents were deported. Under orders from a federal judge in San Diego, immigration officials are still scrambling to locate deported parents. Legal experts worry that, in many cases, returning children to their families abroad will take much longer. Filomena's family, including her 65-year-old grandmother and 2-year-old brother, traveled more than nine hours by foot and bus on Sunday from their village in Guatemala's western highlands to be reunited with her. Guatemalan consular officials in New York had called Nazario to tell him Filomena would arrive Tuesday at the La Aurora international airport in the capital. 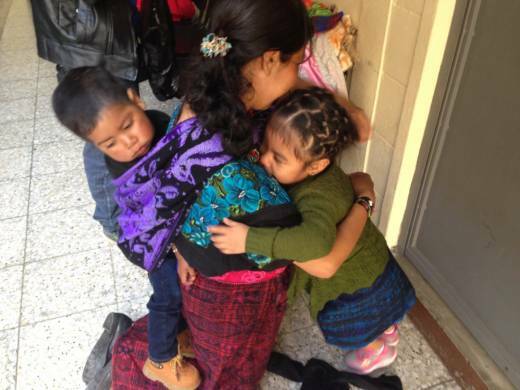 Guatemalan government officials escorted Filomena and three other children in a white van from the airport to the child welfare home, where dozens of parents waited expectantly for their children to arrive. Reporters from local and international media outlets prowled the street outside the shelter's thick wooden doors, as officials didn't allow them to enter the building for most of the day. In the afternoon, Nazario and his family emerged, carrying Filomena wrapped in a thick red blanket. They tried to protect her from the crowd of clicking cameras and reporters demanding, "How do you feel? How do you feel?" The family rushed away and headed for a migrant shelter in the city where they had been staying, to find a more tranquil setting to reconnect with Filomena. They planned to spend the night there before heading back to their village outside Huehuetenango. The family's first dinner together in months was plates of rice, beans and hot dogs, served by the shelter staff. Filomena sat between her mother and father at the table, and laughed often. She was excited to retrieve a white and pink teddy bear she traveled with and show it to her little brother, Marvin. Filomena then kissed the toddler on the cheek. Next, she took a Mickey Mouse doll from her bag and, giggling, said, "This one I brought for my little brother!" When she arrived from the United States, Filomena was wearing black leggings and a pink t-shirt. But by evening, her mother had changed her into a handwoven Mayan skirt and blouse, similar to Marcela's own. NOTE: In earlier stories, KQED spelled the girl's name Filemona, as it appeared on a U.S. court document filed by Nazario. In fact, her name is spelled Filomena, and appears that way on her Guatemalan birth certificate.